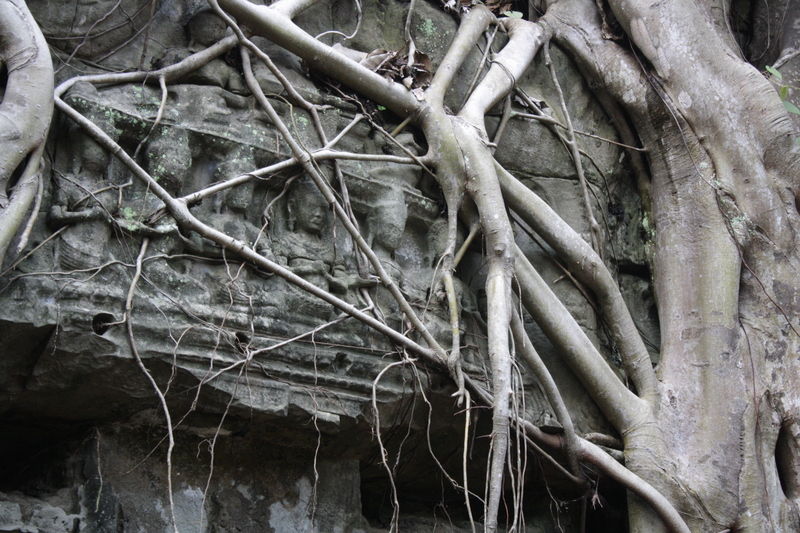 The dark outline of a ruined temple, tangled in the undergrowth, was barely visible through the dense forest. I clambered over ancient steps, made smooth by the passage of time, jumping over the occasional root puncturing the crumbling structure. Scrambling through what appeared to be a collapsed doorway, I entered a cavernous chamber, dimly lit by thin slivers of sunlight penetrating through cracks in the walls. The tropical heat was oppressive, the dank air making it hard to breathe. The silence was punctuated by the susurrating sounds of the jungle outside, as I squinted in the dark to make out the path ahead. 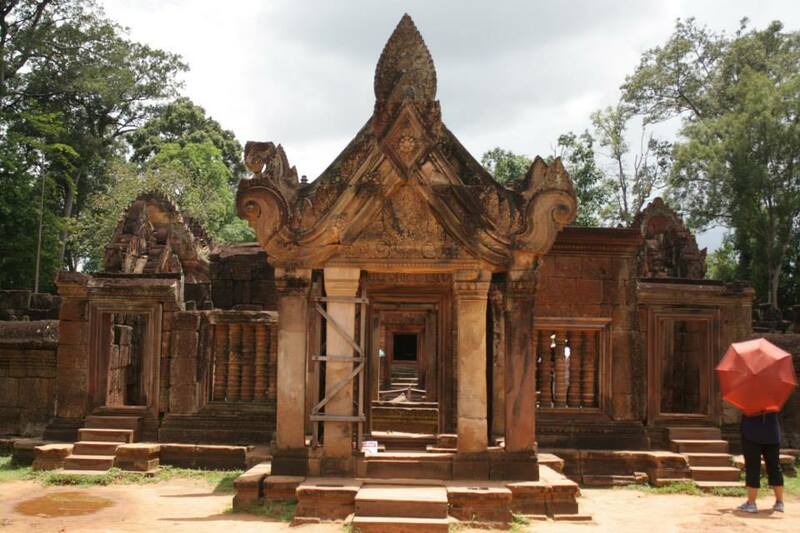 It could have been a scene from Tomb Raider – which would have been appropriate given it was in this ancient Cambodian temple that the movie was filmed. 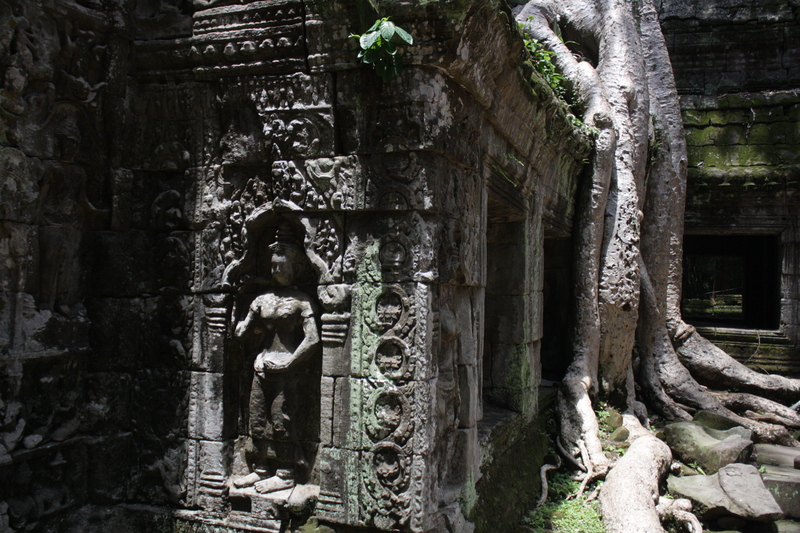 Left untouched since it was discovered, Ta Prohm remains shrouded in mystery. The trees growing out of the ruins to lend a photogenic effect to the collapsed temple, and camera-toting tourists jostle each other for the perfect shot. 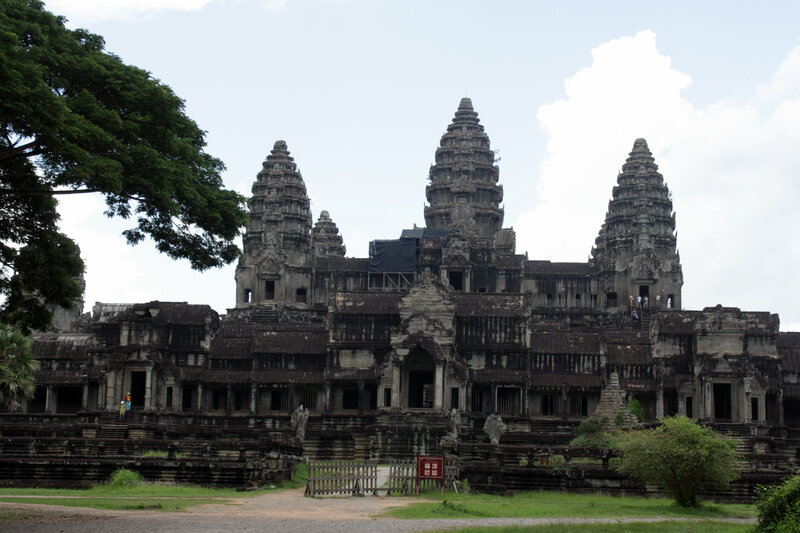 I was in Siem Reap, fulfilling a lifelong dream to visit the fabled temples of Angkor. Contrary to what I’d expected, there was more to Angkor than the famous Angkor Wat. 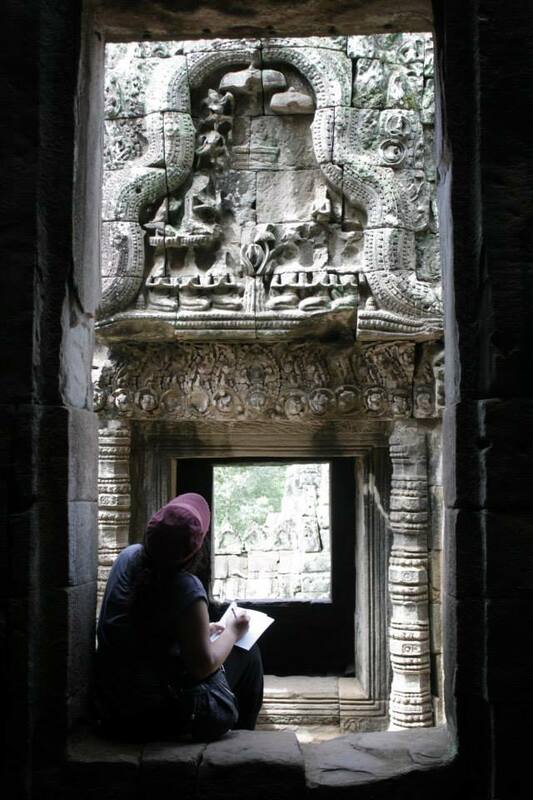 Angkor, the capital of the (now) extinct Khmer empire which spanned most of Southeast Asia between the 9th and 14th centuries, is now a vast metropolis of ruins and an archaeologist’s paradise. 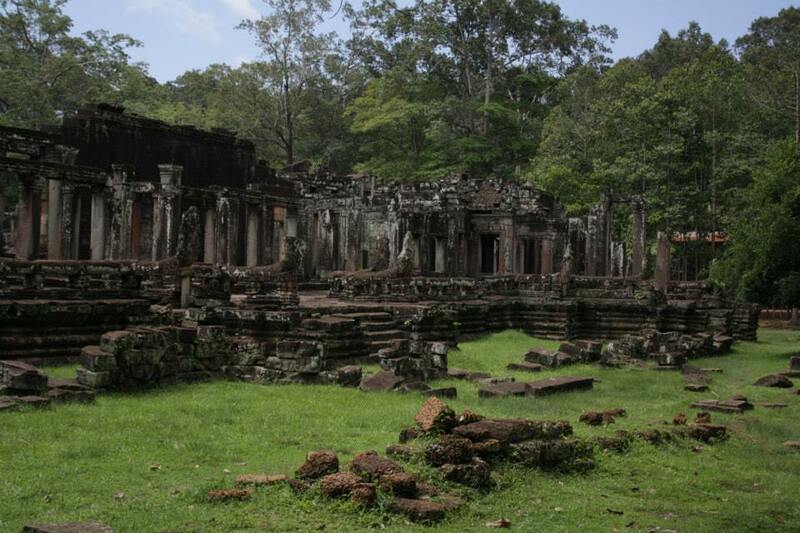 The Angkor Archeological Park is approximately 20 minutes from Siem Reap by tuktuk. The journey to the ruins takes you through lush rice paddies over pot-holed roads. Road-side tea stalls on bamboo stilts and scruffy children running barefoot alongside tuktuks is comfortingly reminiscent of a Bangladeshi village. The crush of Western tourists and the majestic silhouette of Angkor Wat, however, is not. 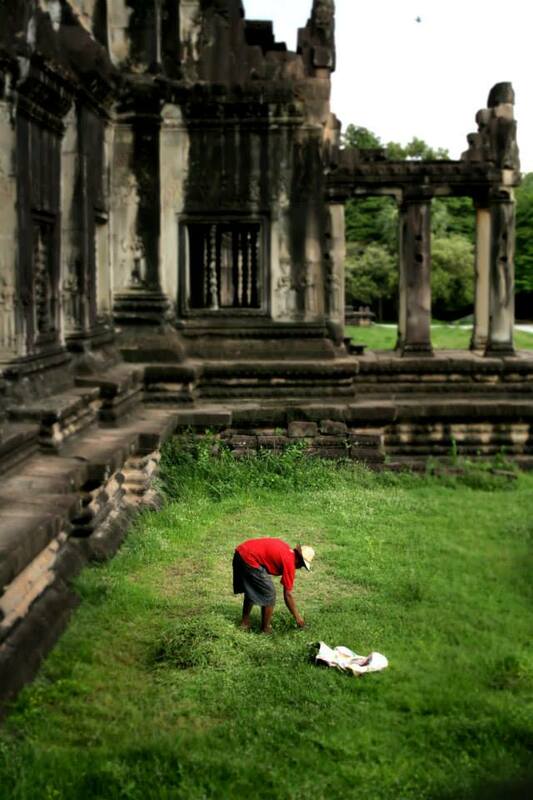 Angkor Wat, touted as the world’s largest temple complex, sits on the edge of an inconceivably immense moat. My wily tuktuk driver whizzed us past the main entrance, where tourists tiredly mopped their sweaty brows as tour guides ranted off historical facts and child peddlers tried to pawn off their wares at astronomical prices. I looked on in confusion, as he left the main road and entered a small path leading into the jungle. A few minutes later, we emerged into a clearing and the elaborate towers of the Wat loomed right in front of us. We were at the lesser known back entrance, which unlike its counterpart at the front, was devoid of a single soul. A serene walk down a solitary path took me through lush green fields to the shell of a building. I was astounded to note the intricate details on the bas-reliefs depicting the sensual Apsaras, the rain-drenched red terracotta in sharp contrast to the moss-covered stone walls. Upon entering the central temple, I was at once amazed by the scale and symmetry of the architectural wonder and the sense of tranquillity that descended upon me. It was only when I was deep in the belly of the ruins that I noticed the first signs of life. After navigating several sets of narrow passages, I chanced upon a small courtyard. 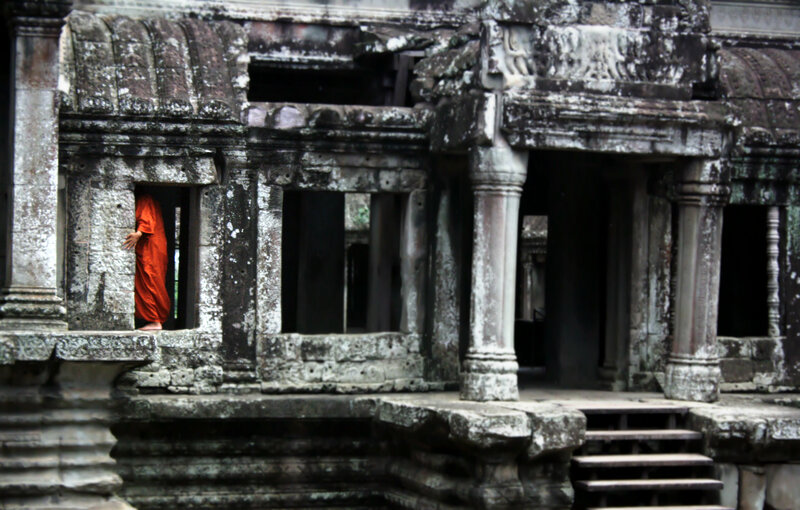 A saffron-robed monk hastily receded through a doorway which faced a row of stone Buddhas, their torsos erect in meditation, palms open in devotion and heads decapitated, for reasons ranging from warring religious sects to insufficient restoration funds depending on which tour guide you asked. As I inched closer to the main entrance, I was mobbed by tour groups, hawkers and touts. Leaving the beggars cupping their hands for alms and young families sprawled on mats on the ground having a picnic lunch, as little children played about their feet, I hurried across the bridge spanning the vast moat. Dark clouds rolled in and the heavens opened up. Within minutes, I was soaked to the skin. Seeing my bedraggled state, my industrious tuktuk driver suggested driving to a temple further afield so I could dry off. 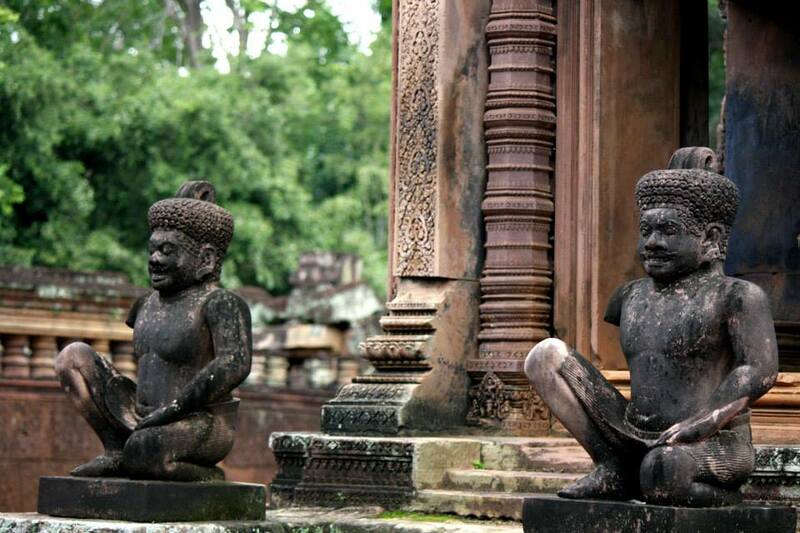 The less-visited Banteay Srei temple complex is located about 12 miles north of Angkor Wat. The complex has some of the most exquisite bas-reliefs of epic battles intricately carved onto the reddish sandstone heralded an era that appeared both spiritual and regal. 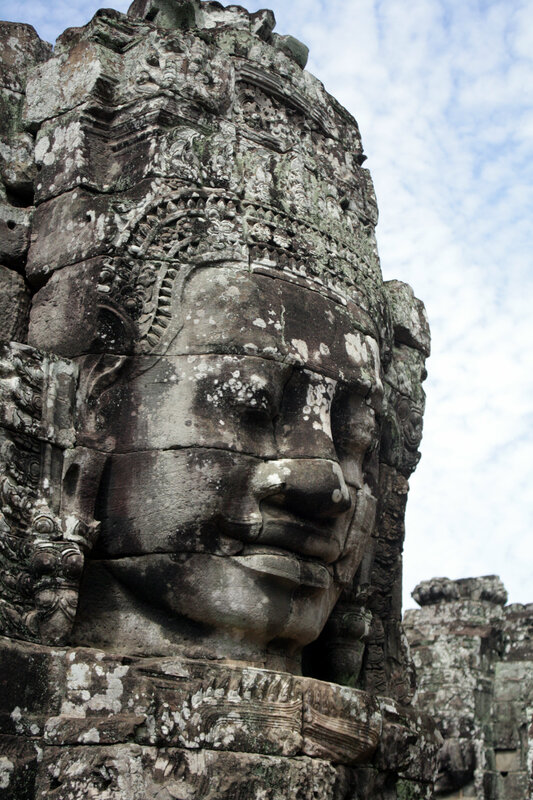 While the Ta Prohm and Angkor Wat bear witness to a civilization’s spiritual devotion, it was the temple of Bayon that captivated me. Each of the towers within this temple is speared by humongous, 2-meter Boddhisattva faces, staring serenely out across the sprawling jungle. There are over two hundred of these giant visages and every one of them wears the same enigmatic expression, managing to look magnanimous, powerful and peaceful all at once.